Kitchen remodeling is one area of home renovations that often brings the most satisfaction both in comfort, functionality, and beauty as well as a return on investment. 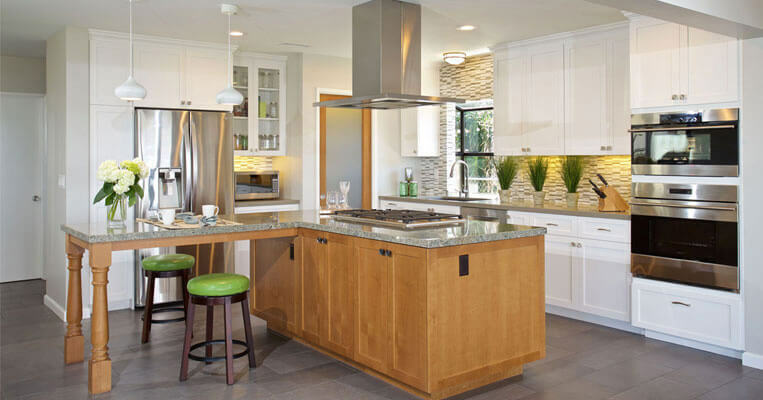 Kitchen remodels can add value and greater appeal to your home when it comes time to sell. The 2016 Cost Vs. Value Report published by Remodeling magazine, reports that a mid-range to upscale, major kitchen remodel in San Diego can recoup about 60-65 percent, respectively, of the cost. You’re likely here because you’ve been thinking about remodeling your kitchen for a while. Maybe you were considering moving versus remodeling. Or, perhaps, it’s just time for a new look in your home and kitchen remodeling is at the top of the list. You’ll find everything from small kitchen remodels to upscale kitchen additions to help you learn more about home remodeling. In our videos and blog articles, we drill down into topics like which products look good but are also the most durable for kitchen countertops. We help you discover redesign ideas for areas of your kitchen that can make a small kitchen seem more spacious and inviting. And we show you how major kitchen remodels can transform an older home. The Marrokal Design & Remodeling team brings passion, 35 years of expertise in design and renovation, and an award-winning reputation to the San Diego marketplace. However, what matters most is how we can help you design a dream remodel that suits your specific lifestyle and exceeds your expectations but is still within your budget. The kitchen remodeling process is often complicated and goes over budget because there are so many choices to make throughout the remodel. We help simplify the remodeling and decision-making process and, because we design and build your kitchen, we help make it more affordable so that you don’t wind up with architectural drafting plans that go way over budget. Learn more about our home renovation process. The kitchen has greatly evolved over the decades. Today great rooms that open to a spacious kitchen allow the entire family and friends to be included in preparing meals. More than ever, having extra kitchen storage space and creatively designed cabinets that hide big, bulky appliances but still keep them in a useful location are high priorities for homeowners. Sometimes a wall needs to come out or the sink needs to be moved to an entirely different area of the kitchen to create a better functioning and attractive space. Maybe you need more light in the kitchen. Adding windows can be the perfect solution to bring in natural light. We keep all of this in mind when we meet in your home and assess the possibilities for your kitchen remodel. We’ll show you things you may not have thought of or believed were possible. Together we’ll co-design a kitchen exactly the way you always wanted it. The original kitchen of this home (circa 1950s) was isolated from the rest of the home. Marrokal’s design team removed walls so the kitchen now opens to a great room and rearranged the layout to incorporate an L-shaped island, now a gathering spot for the family.